Item Description: HP WindsorNot Prototype 4" phone; also know as the Mako. Additional Info: I know this one is a longshot, but looking to round out my collection. Doesn't Derek have one or did he sell his? Have any of them ever been able to get past activation and actually able to make calls? WindsorNot and Mako were not the same thing. There are at least a few known WindsorNot units out there in the world, I don't know that anyone has ever seen a Mako. That image looks.. mysteriously... not like any that I've seen. I'm not really sure exactly how. Like it's got silver sides or something? Some kind of additional plastic over the display? joeytino: I've seen one make calls. It's not real useful, though, the software was definitely not up to par. That thing reminds me so much of a Galaxy S 4 or 5 now. I have one. It's not for sale. "'Form follows function' � that has been misunderstood. Form and function should be one, joined in a spiritual union." It is just the lighting. I too would love one and probably would pay the same price but with so few units (I'm sure less than a half-dozen if not half that) the people that have them aren't likely to let it go any time soon. 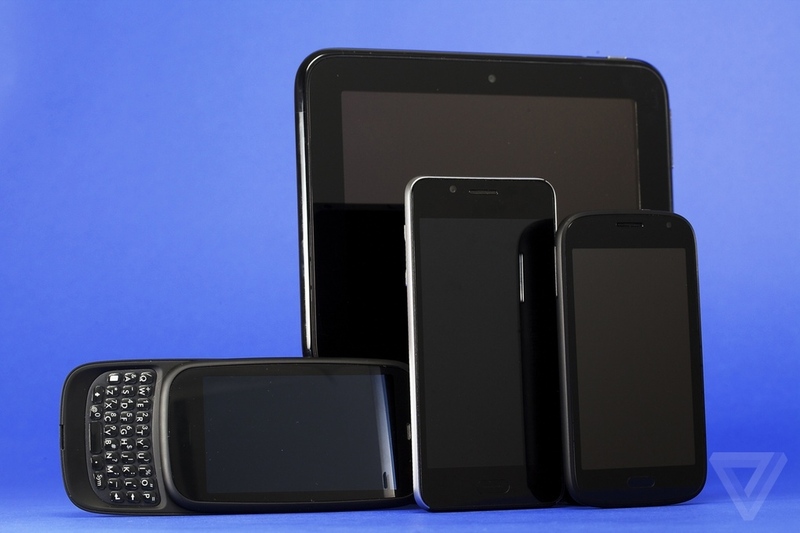 None of the prototype devices I have (PalmOS, webOS, or otherwise) are for sale. Sign, I wish HP had produced more of these prototypes, so we could play with them, or have a time machine, and steal them. From Verge article I'm under impression that Mako is larger and angular so this should be Windsor. Owner of an HP TouchPad (32GB) and a brand new Palm Pre 3 (16GB) for VZ wireless. Mako is center, WindsorNot is on the right (which is also the one pictured above). No Windsor in any of these photos (yes, Windsor is its own device; Pre3 like in shape, never released, for good reasons -- hence the "Not" in WindsorNot, which while being a play on the knot called a Windsor, it is to read more like "Not Windsor"). My recollection is extremely fuzzy by this point, but from what I remember, the WindsorNot project was transitioned into a "platform", meaning it wasn't going to ship as-is but would serve as the basis for a new set of hardware devices. This included the Pre 3 (MantaRay), Stingray (the slate phone seen in the photo), and a future vaguely Stingray-like phone with a hardware keyboard. Meanwhile, the Touchpad Go, Mako, and Twain were based on the Touchpad hardware platform (which had HP lineage, originally as an Android tablet). I think the real WindsorNot (before it was cannibalized into Stingray) had a keyboard still, but I could be totally wrong. There was also something called HalfWindsor (another knot pun) at some point, but it probably evolved into something else. The original Windsor looked exactly like a fatter version of the Pre3 -- at least a few mm thicker and considerably heavier due to its 1500 mAh battery. It had a nVidia Tegra SoC (or maybe Tegra 2). It was originally targeted to ship September 2010 but the project went back to the drawing board (hence WindsorNot) because everyone hated it. For that matter, the Pre 2 was supposed to ship in June 2010 as an upgrade path for owners of the original Pre. The hardware was ready to go but webOS 2.0 wasn't, and the decision was made to delay the Pre 2 to Oct/Nov rather than ship with 1.4.x. Realistically though, the Windsor never would have shipped that early even if we wanted to. It took a long time to get 800x480 resolution supported -- there were only a handful of people working on the software for the Pre 3 (maybe less than a dozen full-time) because everyone was focused on the Touchpad -- and there were hardware issues still being worked out in early 2011. Last edited by jl85; 01/12/2015 at 04:58 AM. It was originally targeted to ship September 2010 but the project went back to the drawing board (hence WindsorNot) because everyone hated it. If I may, what were the factors causing the hate ? The extra weight and thickness due to the battery (that I assume was a must due to using a Tegra) ? The weight and thickness. I don't think the larger battery was related to the Tegra SoC, but I wasn't involved with the hardware so I don't know what happened exactly. I don't know of anyone who's ever seen a Windsor, keeping in mind that there was a Windsor and a WindsorNot. I get the impression that the Not got cancelled in favor of the Pre3, because the Not did not have any 4G tech, and AT&T required 4G for all phones after sometime in 2010 or something like that. In any case, the software on the Not that I'm holding is practically unusable. It's basically a very unstable TouchPad with phone capability. I've seen it make a call, and that worked great, but it crashed and rebooted immediately after. SMS is completely non functional. It's quite difficult to do anything on it, because any time you swipe left, it's interpreted as a back gesture. I used to have Windsor sitting (unused) in my desk cabinet during the Palm/HP days, but I don't recall seeing the WindsorNot. IIRC the Windsor was running webOS 1.4 but at 320x480 resolution. It was only being worked on for a few weeks before they axed it. I do remember something about 4G being a reason for canceling some project, but I think the carriers involved were asking for LTE not HSDPA+. Maybe the Pre 3 was a compromise.